Boots 17 Chat on Twitter this Sunday! 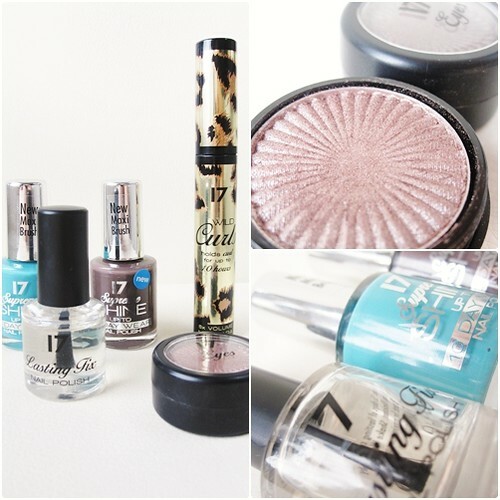 Let me tell you one of favourite high street makeup brands has to be 17... actually it probably is! I have so many loved products from the brand - the Wild Curls mascara, supreme shine nail polishes, their lovely eyeshadows, the shine lipsticks... all just amazing and really well priced. Anyways so this Sunday 17 at holding a 'Twitter party' umm on Twitter at 7pm with two bloggers - @ReallyRee and @MaylovesMakeup and also Vanessa Guallar who is the official 17 makeup artist. I actually really love this idea as hopefully everyone that joins in can suggest products they have tried and loved and all that jazz. Plus it will be great to get some tips from the 17 Makeup Artist! But it doesn't end there.... whilst the chat is going on 17 will be giving away several on-the-spot prizes at random to the most vocal tweeters and the prizes are very good indeed! In addition to the Twitter Party, 17 are also hosting a really great competition on their Facebook page (here) with one lucky winner snapping up an exclusive makeover with 17’s official make-up artist, Vanesa Guallar, tickets to a Summer Camp gig for you and two friends, £500 of high street shopping vouchers and an overnight stay in a top London hotel. All you need to do it click on the Get Involved tab and the competition runs till November 27th and there are all other sorts of prizes too! If you do want to join in all you have to do is tweet using #17cosmetics and that is it! I hope to see some lovely faces there so I can pick every ones brains about the new 17 BB cream and Magnetic polishes which I haven't tried yet!